You probably didn’t choose to be a writer because it’s a lucrative career. I doubt you sat down, thought about all of your career options and decided, ‘Hey…I think I’ll become a writer!’ Let’s face it. Writers are rarely able to quit their day jobs. Yes, there are some who make enough to live on, but most of us barely earn enough to maintain our Starbucks habit. The reason most writers write is because they just can’t help it. You know what I’m talking about. You have a burning desire inside of you. Maybe you felt it when you were reading Dr. Seuss as a child. Maybe it developed slowly over the years. Or maybe it’s something that suddenly dropped into your heart. And if you’re reading this book, chances are you’re convinced that part of your purpose here on earth is to write. It’s more than just a dream. It’s your passion. Each writer’s passion looks different. My passion is to be a multi-published (and preferably wealthy) novelist. Someone else’s passion may be to get published in a particular magazine. To share their testimony. To become a newspaper reporter. Maybe it’s to speak in front of thousands of people. (Pause to shudder). But although we each walk different paths along our writing journey, we do encounter the same obstacles. And, speaking from experience, there are plenty of obstacles! 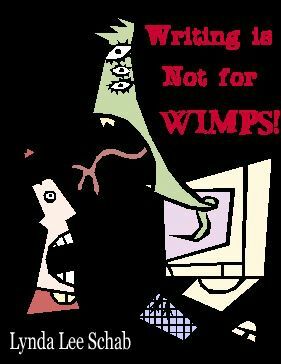 If there’s one thing I know—and you probably do, too—it’s that writing is NOT for wimps. It takes discipline, determination and drive. It takes perseverance, patience, and persistence. It takes STRENGTH. But yet… our inner wimp sits on our shoulder. And he or she tells us we don’t have what it takes. We’re not cut out for the business of writing. That God really DIDN’T call us to write – we must have misunderstood. Wimpiness always stems from FEAR. Here’s an easy-to-remember acronym for FEAR. In other words, as soon as we hear the first ROAR of an obstacle, we cower. Imagine walking past a junkyard. You hear the angry growl of a dog. You can’t see the dog, but in your mind you picture a Doberman Pinscher or an irate Rottweiler, baring his sharp pointy teeth, foaming at the mouth. Your heart starts racing and your eyes dart everywhere, looking for the dog, sure he’s going to attack at any moment, even though your rational mind tells you he’s locked inside the fence and unable to get to you. Do you dive for the nearest bush? Do you turn and run? Do you cross the street and take a detour? Or do you forge ahead, determined to pass the junkyard and reach your destination, despite the angry growl to your left? How often do we, as writers, let “growls” deter us? As soon as we encounter an obstacle, we run for cover. We turn around. We give up. Up pops Inner Wimp. Down goes Inner Faith.